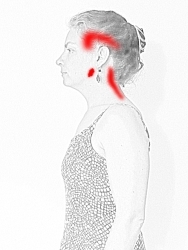 How Can I Stop Shoulders from Aching When I Work on the Computer? When I type on my computer, my shoulders begin to ache. By the end of the day, I’m really in pain. I don’t know if this is from the stress of my job or from my desk, but either way, I need some pain relief. I know that feeling. Sometimes my neck and shoulders ache all the way down between my should blades. It can be painful to turn my head. Many people sit and stand with head forward posture. 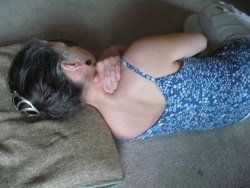 This puts pressure on your neck, shoulders and back, which can lead to aches and pain. Compound this with stress and your day can be miserable. 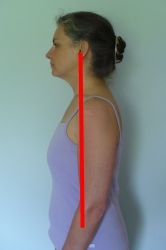 Find out the how to correct your posture. People today have terrible posture. You slump and hunch your shoulders. You bring your head forward. Your bones don’t sit on top of the supporting bones beneath them, and so your muscles have to work overtime to support your weight. Plus, with today’s stressful lifestyle, all of this work is done with muscles which are tight and inflexible. Your spine has 3 curves: the lumbar curves to the front of the body, the thoracic curves to the back of the body and the cervical (neck) curves to the front again. All three of these curves must be present, but not too present, for your back to be aligned. 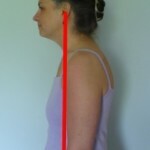 If you drop a line from the middle of your ear, it should hit the middle of your shoulders and the middle of your hips. With head forward posture, the whole thing is wacky. But when your head is forward, the line will fall in front of your shoulders and hips. 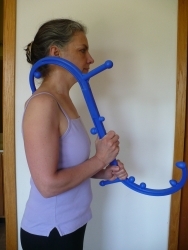 This puts strain on your thoracic, often pulling it down into an exaggerated curve. 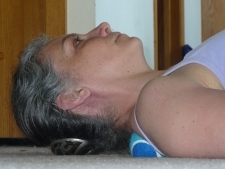 The weight of the head pulling on the top of your chest, closes it and brings your shoulders together. All of this strain is multiplied because of stress. 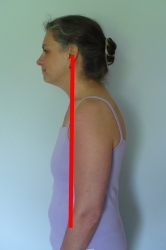 Many factors in our modern life contribute to head forward posture. When we sit at desks, we pull our head forward to the computer screen. When we drive, the seat is angled back, so we pull our head forward to feel upright. And emotionally, we are often planning and worrying about the future. When we “live” in the future, we pull our head forward into it. Of course, it is usually not a quick fix. Good alignment comes from being flexible where you body needs movement and strong where it need stability. Try yoga, especially Iyengar style which emphasizes good alignment, to help you gain alignment. It works with both strength and flexibility. Pilates can build core strength which will improve posture. Try a classical pilates class. They use nifty machines with smooth, glide-y springs. It’s fun and it helps your body to feel good. Good posture is partly good habits. You can remind yourself to sit up straight periodically during the day. Take time to notice how you feel before you correct yourself. Does it feel good to slump? Where are you closing and where are you over stretching? Make sure you have ergonomic office/home equipment, wherever you spend your time. When sitting, you can either pad your chairs with lumbar support to encourage yourself to keep your spine neutral, or sit on the edge of your chair. 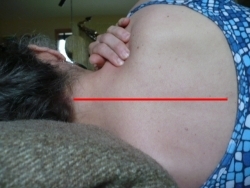 If your back doesn’t have support to lean against in a slump, it will hold itself up. 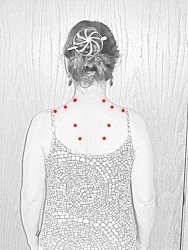 Awareness of you body can also help your posture. 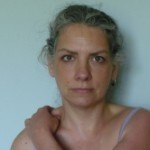 Improve your physiological habits using Alexander technique or Feldenkrais technique. 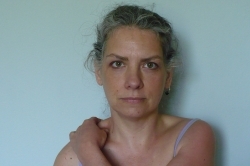 Both of these build awareness of how we hold our bodies, with what habits we move our body and in what ways we hold tension. 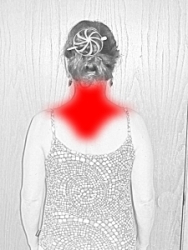 When we use our body with awareness, we can regain alignment and reduce pain. Exercising more, especially with weight training can also bring your back into alignment and decrease your head forward posture. 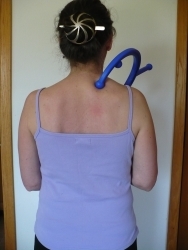 There are many exercises which will improve posture, decrease the head forward posture and reduce your back pain. Taking a break every hour or two and stretching can give you back muscles relief.